On July 7 in Las Vegas, UFC heavyweight champion Stipe Miocic defends his title against light heavyweight boss Daniel Cormier in a true SuperFight. The bout, which headlines the stacked UFC 226 card, will likely produce another addition to Miocic’s growing list of defining moments. With a win over his first contender under his belt, Miocic started looking for gold in the heavyweight division, and after back-to-back wins over Gabriel Gonzaga and Fabio Maldonado, he was matched up with former world champion Junior Dos Santos in the UFC on FOX main event in Phoenix on Dec. 13, 2014. What followed was one of the best fights of 2014, as the two heavyweight bangers slugged it out for 25 back-and-forth minutes. When the smoke cleared, “Cigano” got the victory, but Miocic knew that he could hang with the best in the business, and he was about to make his move. Five months after the loss to JDS, Miocic went “Down Under” to Adelaide, Australia for another main event showdown, this one against Mark Hunt. What followed was a one-sided battering from Miocic to “The Super Samoan,” and while the Ohioan didn’t get the early finish, that was more a product of the referee and Hunt’s corner not stopping it, and not any fault of Miocic’s. 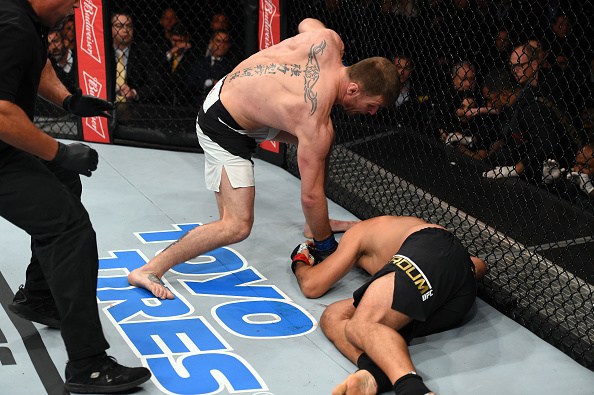 But with that fifth-round TKO victory, it was clear that Miocic was ready for a shot at the belt. Following his victory over Hunt, Miocic was slated to face Ben Rothwell in October 2015. An injury scrapped him from the bout, though, putting him on the sidelines until January 2016, when he blasted through former heavyweight champ Andrei Arlovski in less than a minute. Four months later, Miocic was in the Octagon in Brazil, facing champion Fabricio Werdum in his home country. But in less than three minutes, Miocic had removed that belt from Werdum’s possession, giving Cleveland a world champion. It was fitting that Miocic’s first title defense in September 2016 took place in Cleveland, and while he survived some dicey moments early against Alistair Overeem, he roared back to stop “The Reem” in 4:27 of the first round to successfully defend his crown for the first time. Next up was the rematch he craved, this time with his belt on the line. There was no bad blood between Miocic and Dos Santos before and after either of their fights, but the competitive nature of Miocic wasn’t going to let that first loss to “Cigano” sit without a response in their rematch. And while the champion caught several hard kicks to the leg that had him wobbling early, he quickly changed tactics and went for the finish – and got it – halting the Brazilian at 2:22 of the first round. According to many fans and pundits, Francis Ngannou was the man who was going to rule the heavyweight division with an iron fist for years to come. And “The Predator” may still find his way to the top spot, but not on January 20, 2018, the night Miocic showed why he’s considered the UFC’s best big man – not just today, but of all-time. It was a five-round clinic by Miocic that resulted in a shutout unanimous decision and led him to his next challenge against Cormier this summer.